Full skirts and flowing chiffon were the signature wedding styles of the mid-1950's. My Fair Lady opened on Broadway in 1956, Elvis Presley released his first film, and Grace Kelly married Prince Ranier of Monaco. Simple grace is presented in this lovely wedding or evening gown. 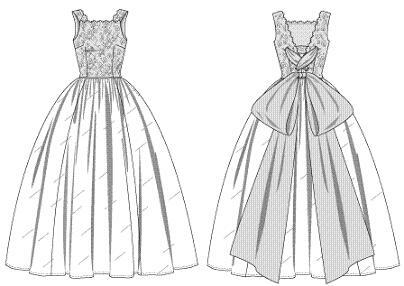 #N207 Gown has close fitting bodice with squared neckline, wide shoulder straps and lace overbodice. Back of gown has a criss-cross inset and large bow. Zipper closure. This dress is constructed using a period pattern made to modern measurement. 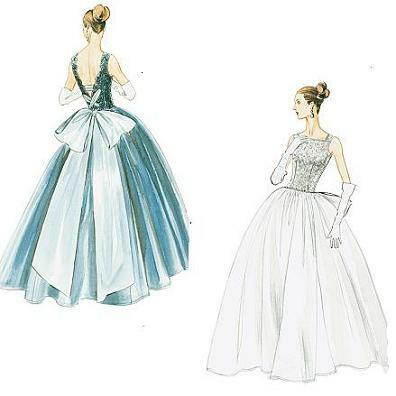 These gowns are constructed of quality wedding gown weight satins, chiffons and lace.